Spanish riot police forcefully descended on polling stations and rallies in Catalonia on Sunday, as the region held a independence referendum that the country's government in Madrid had attempted to stop. The referendum saw police use rubber bullets and batons in their operation to seize ballot boxes and shutter voting sites. At least 800 people were injured in the crackdown, according to the Catalan regional government. 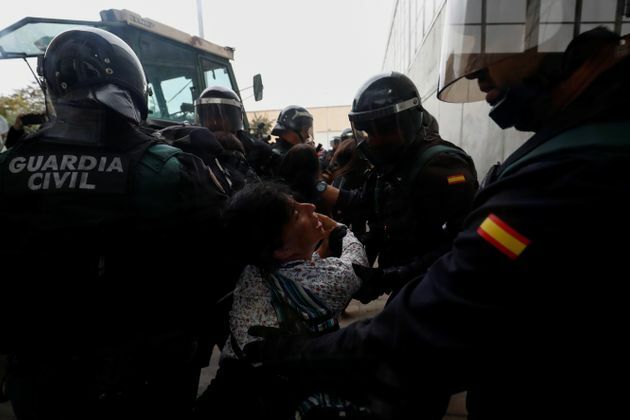 The shocking scenes of unrest and violent tactics of the police brought international attention to Catalonia, with the subsequent chaos from the actions to stop the referendum giving additional weight to the symbolic independence vote. The violence threatens to deepen the longstanding divisions between Catalan separatists and the Spanish government, putting pressure on Prime Minister Mariano Rajoy and ensuring that the issue of independence will only become more prominent in the days to come. 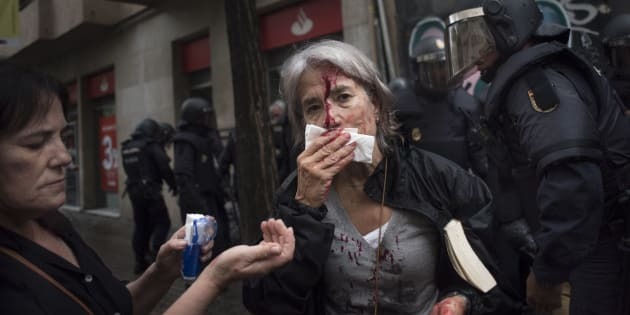 Images and videos circulating from Barcelona, the capital of the autonomous region, and other cities across the area showed officers violently shutting down a peaceful referendum, albeit one banned by Spain's central government and deemed illegitimate by the country's courts. Footage captured police smashing through glass doors and dragging away dissident citizens attempting to protect polling stations. Spanish Civil Guard officers scuffle with a woman outside a polling station for the banned independence referendum. Some protesters tussled with authorities, leading to several arrests and reports that at least 12 officers had been injured. In a further sign of the divide between regional authorities, Spain's riot police got into confrontations with Catalan regional officers and firefighters attempting to allow the rallies and referendum to proceed. 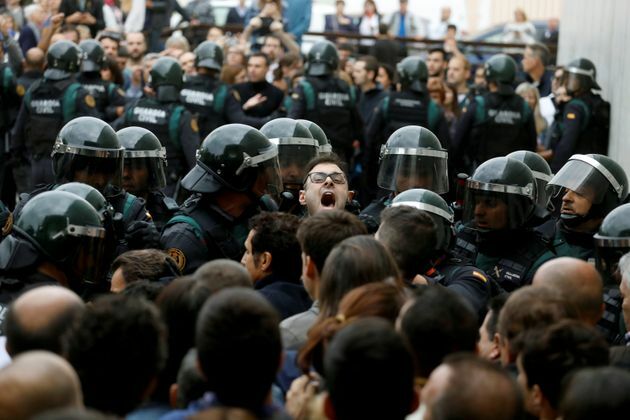 Spain's police closed nearly a hundred polling stations in all, and arrested several protesters. 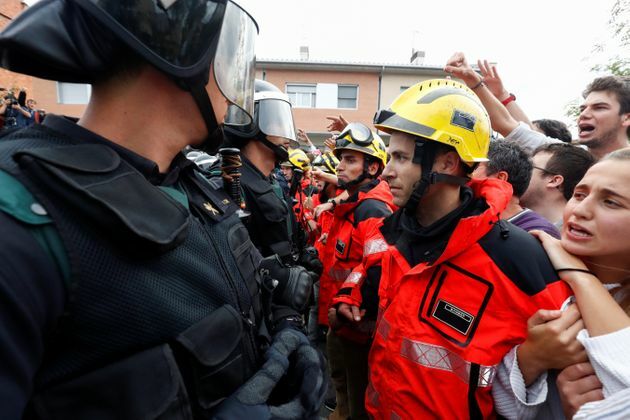 Firemen and people face off Spanish Civil Guard officers outside a polling station for the banned independence referendum in Sant Julia de Ramis, Spain Oct. 1, 2017. The clampdown also deepened political divisions between Catalan government officials and Spain's leadership in Madrid. Tensions over the referendum have been rising for months as the vote approached, and as violence erupted on Sunday both sides blamed one another for the situation. Barcelona's Mayor Ada Colau called for Prime Minister Rajoy to resign following the crackdown, saying "he is a coward who does not live up to his state responsibilities." Catalan President Carles Puigdemont, meanwhile, claimed that the police actions would eternally shame the country. 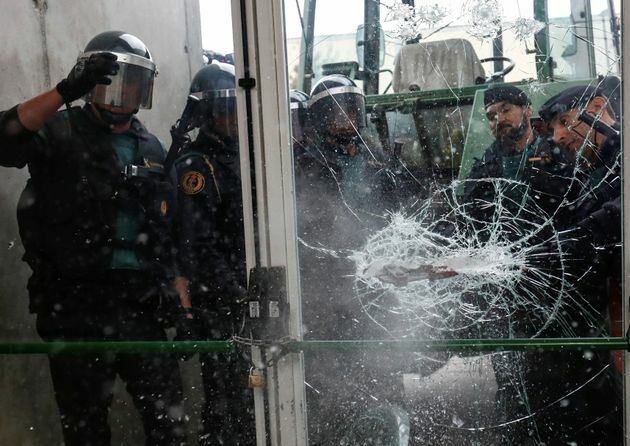 Spanish Civil Guard officers break through a door at a polling station for the banned independence referendum on Oct. 1, 2017. Several leftist Spanish politicians also joined in the calls for Rajoy's ouster, adding to the prime minister's political woes. He is currently the head of a relatively fragile minority government that has already run into trouble in recent weeks from political partners protesting his handling of Catalonia's bid for secession. Rajoy defended the police actions on Sunday as a justified response to Catalonia's attempts to break "the rule of law," while denying that a referendum had taken place, emphasizing the lack of participation and the illegality of the vote. But although Rajoy has always had the support of the European Union and the courts in rejecting the legitimacy of Catalonia's referendum, the harsh response from authorities could embolden the separatist movement. Scuffles break out as Spanish Civil Guard officers force their way through a crowd and into a polling station. The level of support for independence in Catalonia is not entirely clear. Polling was scarce in the lead up to the election, but a survey from July showed that only around 41 percent of people in Catalonia favored independence. Most major European Union officials were largely silent over the events in Catalonia, although some figures including Belgium's Prime Minister Charles Michel and the EU parliament's Brexit chief Guy Verhofstadt condemned the violence. Scottish leader Nicola Sturgeon, who has pursued a second independence referendum for Scotland in the United Kingdom, called Spain's actions "wrong and damaging." People protest as police try to control the area at a polling station in the referendum vote. Police and gendarmerie crew intervene to stop voters in the Catalan independence referendum. Riot police drag a member of the public away from a school being used as a polling station. Clashes between voters and the police injured hundreds on Sunday. Police seized ballots and closed polling stations during the vote. Riot police clash with members of the public outside a school being used as a polling station for the banned referendum. There were several arrests amid the demonstrations. Police fired rubber bullets in some areas and used batons.